This is another great model of recumbent bike to go with. Exerpeutic has managed to make our list of the best recumbent bikes more than once, and there is a good reason for it. The Exerpeutic 400XL is a really neat model because it comes with a good mix of affordability, convenience, user functionality, and durability too. 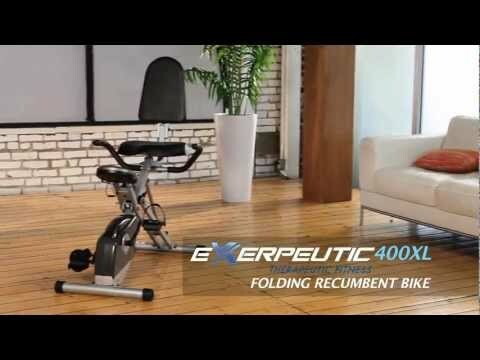 If you would like to find out a little bit more about the Exerpeutic 400XL Folding Recumbent Bike, checkout the video presentation below. The Exerpeutic 400XL Folding Recumbent Bike has a few really neat features that we like a whole lot, so what are they? The beauty about this Exerpeutic Recumbent Bike is that it is very lightweight and space efficient. This makes assembly easy, it means that it does not take up too much space, and it is easy to maneuver around your home too. There is also the fact that the folding frame creates a compact package that is easy to store in tight spaces. The Exerpeutic 400XL Folding Recumbent Bike comes with a decent warranty in case anything happens to go wrong with it. It comes with a 1-year limited manufacturer’s warranty. 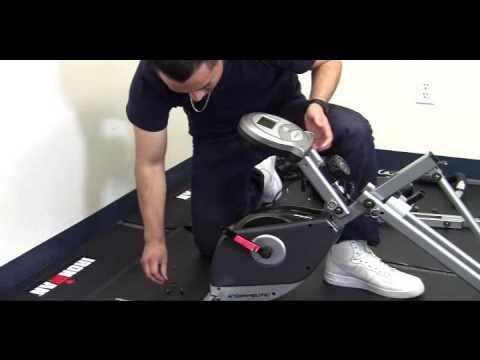 The Exerpeutic 400XL Folding Recumbent Bike is easy to assemble. It is lightweight and fairly small, so one person can easily do it alone. Moreover, the instructions are very clear, almost more so than is needed, plus all tools and connectors come included in the package. One person should be able to assemble the Exerpeutic 400XL Folding Recumbent Bike in about an hour, but you can always get expert in-home assembly for an extra fee. 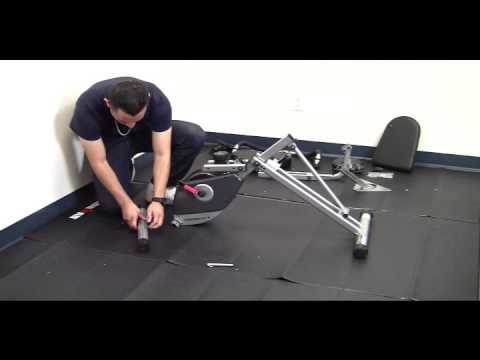 If you would like to watch an assembly video for the Exerpeutic 400XL Folding Recumbent Bike, check out the videos below. There are a few specific things that we really like about the Exerpeutic 400XL Folding Recumbent Bike, so let’s go over them in depth. Perhaps the best part about the Exerpeutic 400XL Folding Recumbent Bike is that it has a very space friendly design. The whole thing does not take up very much room at all. Even better is that it has a folding frame which makes it about half the original size, making it easy and convenient to store in a tight spot. Also, this model is very lightweight, making it easy to maneuver from one spot to another. If you need a recumbent bike that is convenient and space friendly, the Exerpeutic 400XL Folding Recumbent Bike is a really good option to consider. Another awesome aspect of the Exerpeutic 400XL Folding Recumbent Bike is that it is actually quite strong for being such a small and inexpensive recumbent bike. The frame is made of tube steel to ensure maximum durability, and it has a user weight limit of 300 pounds, which is very impressive for a recumbent bike with a folding frame. The Exerpeutic 400XL Folding Recumbent Bike also comes with leg stabilizers to make it stable on uneven ground. Yet another thing that we like about the Exerpeutic 400XL Folding Recumbent Bike is that it has 8 levels of magnetic resistance. We’ve said it before and we will say it again, magnetic resistance is the way to go. The resistance, combined with the double transmission and solid crank system provide you with a very smooth and constant power ratio when pedaling. Moreover, everything about the Exerpeutic 400XL Folding Recumbent Bike is very quiet too, to the point where you can even watch TV while using it. The next thing that we like about the Exerpeutic 400XL Folding Recumbent Bike is that it has a very comfortable seat. Both the seat and backrest are ergonomically designed to fit the shape of your back. This, plus the adequate padding, helps to eliminate back pain. Even better is that the seat can be adjusted for position in order to suit users of various sizes. The pedals on the Exerpeutic 400XL Folding Recumbent Bike are also quite comfortable and reliable, as they come with straps and some good grip too. There are a couple of minor issues with the Exerpeutic 400XL Folding Recumbent Bike that are worth mentioning in passing. One of the things that we don’t like about the Exerpeutic 400XL Folding Recumbent Bike is that some people have noted that the folding feature can be a little hard to get the hang of at first. Another thing that we don’t like about the Exerpeutic 400XL Folding Recumbent Bike is that it is a little wobbly. While it does come with leg stabilizers, these are more for making adjustments on uneven ground as opposed to increasing the overall stability. The narrow base does mean that this recumbent bike is a little wobbly. To give you a little reference point when purchasing your own recumbent bike, let’s talk about some of the alternatives to the Exerpeutic 400XL Folding Recumbent Bike. What is kind of interesting is that the Exerpeutic 400XL is more expensive than the ProGear 555XLT. Now, this may be because it is much more convenient thanks to the lightweight design, compact nature, and folding frame of the Exerpeutic 400XL Recumbent Bike. However, the ﻿ProGear Recumbent Bike has 6 more levels of resistance than the Exerpeutic model, it has 3 workout programs which the Exerpeutic does not have, and it also has a stronger and more stable frame. This is a good alternative to consider as well. What does need to be said is that the Sunny Health & Fitness model is a little cheaper than the Exerpeutic 400XL. This is probably in part because the Exerpeutic has a higher weight limit, 80 pounds more to be exact. However, both of these models have pretty decent durability, they are both lightweight and compact, they both have a folding frame, and both have 8 levels of magnetic resistance. These two models are indeed very similar, with another exception being that the Exerpeutic 400XL Recumbent Bike also has floor stabilizers. The bottom line is that the Exerpeutic 400XL Folding Recumbent Bike is a pretty good choice to go with no doubt. It is slightly on the more expensive side in terms of entry level models, but it is worth the investment. 8 levels of magnetic tension, a good seat, a folding frame, and a high user weight capacity are all things that make the Exerpeutic 400XL Folding Recumbent Bike a good entry level choice.